The Instruction Committee is continuing the conversation on Inclusive Information Literacy! A Twitter chat is a public Twitter conversation around one unique hashtag! Use the #InclusiveInfoLit hashtag to follow the discussion and participate in it. For more on Twitter Chats check out the information in the guide below! Introductions- Let’s start with brief intros! Please introduce yourself (name, location, work title, professional interests, etc.). Don’t forget to use #InclusiveInfoLit for all your tweets! Participating in Twitter Chats requires a free Twitter account. For this twitter chat, follow #InclusiveInfoLit on Twitter during the time of the chat by searching for "#InclusiveInfoLit" in the search field, then clicking on the "live" tab to see the most recent tweets. You’ll need to refresh your search periodically to see the most recent tweets pop up. 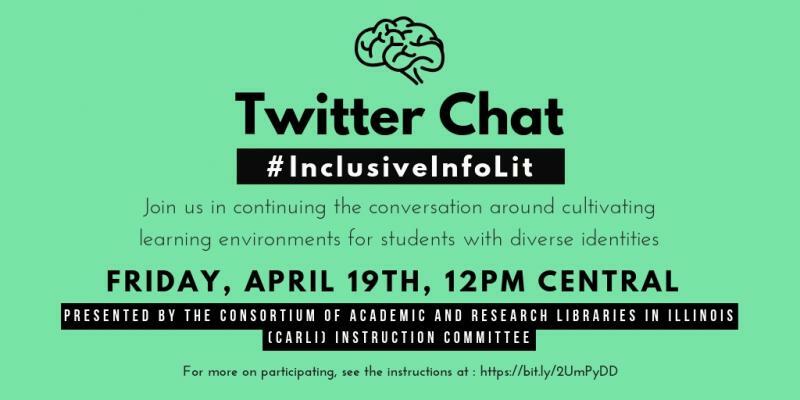 The first five minutes of the chat are a chance for introductions: you might tweet, "Hi #InclusiveInfoLit, I'm Miss Scarlett and I work as a reference librarian in a public library in Idaho." After people have had a chance to introduce themselves, moderators will tweet a question, such as: Q2. Do you like cats? #InclusiveInfoLit. You would then reply with: A2. Of course I like cats. #InclusiveInfoLit. Providing the hashtag #InclusiveInfoLit on your tweets allows for collocation of all tweets in the discussion. When the chat is over, all tweets with the #InclusiveInfoLit hashtag will be gathered together and the moderators will provide a digital archive of the conversation. Including capital letters when you hashtag will make it screen reader friendly; so please use #InclusiveInfoLit instead of #inclusiveinfolit; our thanks for the heads-up on this tip! Use Tweetdeck, Tweetchat, or another app which allows for automatic loading of tweets. In Tweetdeck you can add a separate column which displays all the tweets with the #InclusiveInfoLit hashtag. Remember to add the #InclusiveInfoLit hashtag to each of your tweets so people will see them. Consider putting your phone on airplane mode so you don’t get inundated with Twitter notifications. If your Twitter account is private (locked), feel free to participate, but be aware that only your followers will be able to view and interact with your tweets. Jump right in! The success of a chat depends on lots of folks being willing to share their thoughts and experiences on a topic, even when they're not experts. We're glad to have new folks participating! Need any more help? Feel free to tweet at or direct message @libeyrian or @librarymarielle who will be the moderating the chat and they'll be happy to help!